Doris J. (Zimmerman) Dykhouse, 91, of Grant, went home to her Lord and Savior on February 5, 2019 in Newaygo, Michigan. She was born on April 23, 1927 to James and Evelyn (Bowen) Lobdell in Casnovia, Michigan. She graduated from Kent City High School in 1945. Doris was a Homemaker and loving mother. 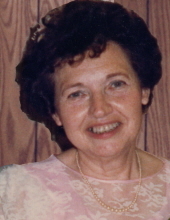 She married Ralph J. Zimmerman on October 20, 1946 in Casnovia, Michigan and he preceded her in death on July 15, 1981. She then married Gerrit "Bob" C. Dykhouse on July 12, 1987 in Grant, Michigan and he preceded her in death on March 12, 2012. Doris is survived by daughter Marva (Michael) Yonker, daughter Ileen (Larry) Hubbard, daughter Connie (Earl) VanDyke, son John (Julie) Zimmerman, son Lynn (Suzanne) Zimmerman, daughter Sheila (Donald) McQueen, step-daughter Kay (Stuart) Stone, step-daughter Mary Jane (Richard) Oakes, 18 grandchildren, 27 great-grandchildren. She was also preceded in death by her parents, brother James Lobdell, sister Audrey Smith, brother William Lobdell. Visitation will be held Sunday, February 10, 2019, 4:00 pm - 6:00 pm at Fields-McKinley Funeral and Cremation Services, Grant, Michigan. Funeral services will be held on Monday, February 11, 2019, 11:00 am at the Grant Wesleyan Church, Grant, Michigan with Pastor Jeff O'Vell officiating. Interment in the Seaman Cemetery. Memorials are suggested to The Gideons International, Michigan Make-A-Wish Foundation, Grant Wesleyan Missions, and Newaygo County Animal Shelter. Please share your memories of Doris online at www.fieldsmckinley.com. To send flowers or a remembrance gift to the family of Doris J. Dykhouse, please visit our Tribute Store. "Email Address" would like to share the life celebration of Doris J. Dykhouse. Click on the "link" to go to share a favorite memory or leave a condolence message for the family.